Goat’s Beard is native to eastern North America as well as parts of Europe and Siberia. It can get quite tall, as high as 6 feet, producing foot tall plumes of feathery flowers. There are also a couple of dwarf varieties that are wonderful for the front of the shade border. There are male and female plants, the male being slightly showier in flower than the female. Goat’s Beard are an excellent alternative to astilbe and a great back of the border perennial. They prefer moist well drained soil in part shade, but will tolerate nearly full shade or full sun and still grow quite vigorously. Full sun is no problem in northern climates, but should be shaded in the afternoon at minimum further south. When grown in deep shade the foliage will be more open and blooming will diminish. In periods of drought the foliage may brown at the edges without supplemental watering. The plant will grow slowly in the first season or two until well established. Make sure you allow plenty of room when you plant Goat’s Beard, if it becomes crowded it does not like to be transplanted. Moist woodland settings or pond edges are ideal for Goat’s Beard. Leave foliage to overwinter and cut back in early spring. Goat’s Beard nectar will also attract butterflies. Maintenance: Easy to grow and care for, mulch to retain soil moisture. Other: Slow growing, slow to establish, once established does not transplant well. Attracts butterflies. Excellent fall color. Aruncus aethusifolius is a dwarf Goat’s Beard that forms a dense feathery mound only about 6 inches tall. It is generally marketed as ‘Noble Spirit’. The fine foliage is fern-like with light green leaves, In fall the foliage turns lovely shades of yellow and orange red. 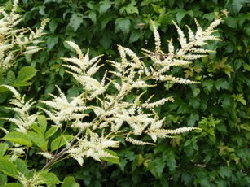 The plumes of tiny ivory flowers rise above the foliage on reddish stems to about a foot. The plumes are reminiscent of astilbe. The spent stalks can be cut back to freshen the plant, but it will not encourage additional blooming. Many gardeners prefer to leave the flower stalks to enjoy the dried seed plumes, which may produce new plants. In northern climates full sun will be tolerated, but in warmer regions afternoon shade will be necessary. Typically this perennial does not perform well in hot regions from zones 8 and 9. Goat’s Beard should not be allowed to dry out as the foliage will decline rapidly. This dwarf Goat’s Beard is a perfect front of the border perennial for a woodland or pond edge, shade garden or shaded rock garden. Lovely filler in a fresh arrangement. Aruncus dioicus is native to the central plains and into Canada, found generally in moist woodland areas. Tall plumes of creamy white flowers rise high above the foliage, often reaching 6 feet tall. Mass of blooms create a dramatic effect from spring into summer. The male plant produces many stamens on each flower which produces a bit more showy bloom than the female, which produces three stamens per flower. The female flowers are pendant, whereas the male flowers are erect. Spent flower stalks may be cut back to freshen the plant but will not encourage additional blooming. Many gardeners prefer to leave the flower stalks to enjoy the dried seed plumes, which will likely produce new plants. Goat’s Beard will grow quite happily in full sun in zone 3 or 4, but will require more and more shade further south. In the warm region of zone 8 Goat’s Beard may suffer from the heat and will prefer quite heavy shade. Goat’s Beard is quite spectacular when planted in the shade of a moist woodland garden and is an excellent choice for a shaded rain garden.